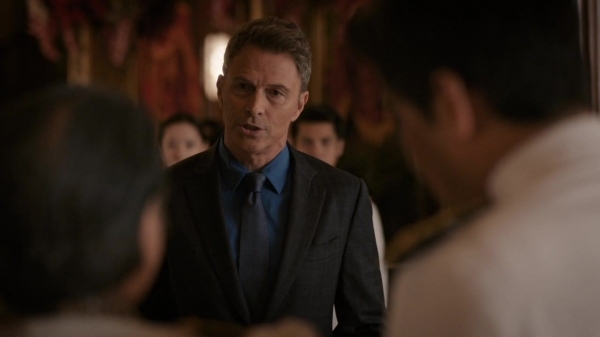 Most of the “political” action of this episode takes place with Henry’s trip to Thailand rather than with Elizabeth in Washington. 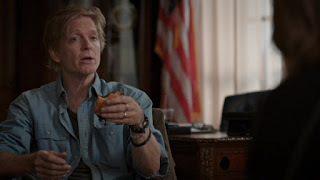 As the episode opens, Henry is packing for his trip and Elizabeth is uncharacteristically jealous and insecure over the fact that Henry will be meeting up with an old girlfriend – Rochana Arak (Kimiko Gelman). It doesn’t help that she’s also recently divorced. It’s actually a nice way to really humanize Elizabeth – even someone who is about to run for President can lack self-confidence. Elizabeth and Henry have to meet with Jason’s school counsellor, Colleen (Michelle Wilson) before he leaves. Jason has managed to earn scholarships to three colleges. He has his pick between Vaser, Northwestern, and Vanderhoff. Given that only one of these is made up, I’m betting he goes to Vanderhoff… Jason has a limited amount of time to claim the scholarships, however. Blake (Erich Bergen) is waiting for Elizabeth with a scone when she arrives (yes. I’m jealous of that scone!) and news that he also has an invitation for Henry to attend the King of Thailand’s birthday reception. 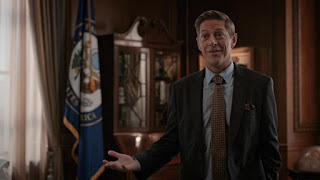 Mike B (Kevin Rahm) is also waiting for Elizabeth – in her office. He is super excited about the not yet campaign and the money the superpac is already generating. 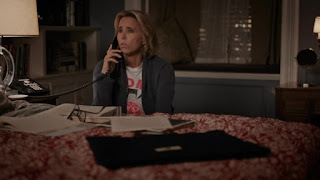 He’s there to pester Elizabeth into writing a memoir – to “create the myth.” He’s lined up Lorraine Sheridan (Susan Blackwell) to ghost write, promising it will mean almost no additional work for Elizabeth. In Thailand, Henry meets Rochana for dinner. As it turns out, she’s from Thailand. They talk about old times and catch up as they haven’t seen each other in 25 years. Henry says he’s sorry about her marriage, and she assures him it’s ok. It’s like getting a second chance. Henry is clearly a bit uncomfortable when she lays her hand on his after thanking him for coming to support her while she gives her speech. He pulls away, but it seems clear she may have been hoping for the old spark. When Rochana makes her speech, she is clearly trying to provoke the government. I liked how the show had Elizabeth reading Henry his White House brief on Thailand etiquette in the opening scene so that we know that Free Speech does not exist in Thailand and it comes as no surprise when the police rush in and take her off to jail when she demands people stop worshipping the King. She is sentenced to 60 years in jail, and Henry appeals to Elizabeth. He had no idea that she was going to say what she did, and he hopes there’s some re-course through diplomatic channels. However, Elizabeth is constrained by the fact that Thailand is one of their biggest trading partners, so she can’t do much more than insure that Rochana is treated well. I liked that they take a realistic view here – at least in this scene. Henry wants to try to appeal directly to the King at the birthday reception. Elizabeth tells him that officially, he is there as a representative of the President, but unofficially, if he gets his moment he should use it wisely. Henry does ask – rather boldly – for the pardon as he’s being introduced to the King and he persists even as the interpreter tells him to stop. It’s a bit of a shock when Henry has barely left the room and the interpreter tells him the pardon has been granted. The next unexpected obstacle is that Rochana doesn’t want to leave. It will make her action meaningless. 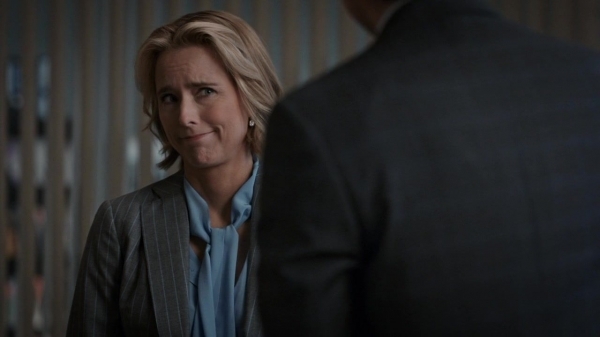 Henry points out that she’d never see her kids again. He doesn’t understand her quest for martyrdom and tells her “this quest for ideological purity is a dead end.” She accuses him of suffering from the same inclination – she’s not wrong – but Henry has tried to learn from his mistakes. Since the end of her marriage, Rochana has felt that her life lacked meaning and this was a way do something meaningful with it. Henry tells her to be brave and stay in the fight. I was rather disappointed in this rather dreary plot turn that she would consider her life over without her marriage. Unfortunately, the King dies before he can get Rochana out of the country and they are both taken to prison. Elizabeth lies to the kids when they are alarmed about the uprising and tells them that Henry is already in the air – before heading to the Oval office to sort it out. Dalton (Keith Carradine), Gordon (Mike Pniewski), Ellen (Johanna Day), and Ephraim (Clifton Davis) are all there, working on the solution. 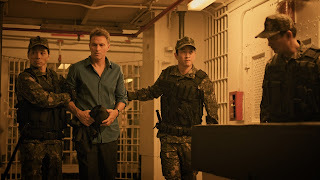 Dalton opts for a military extraction. I really liked this op as the soldiers go in pretending to be Thai. Rochana is reunited with her kids at Joint Base Andrews, and Henry tells her that she’s not lost. Jay (Sebastian Arcelus) briefs Elizabeth that the Thai aren’t happy about the extraction but the military has at least stabilized the area. Elizabeth meets with her ghost writer several times. During the first meeting, she asks Elizabeth to think of the first time – the earlier the better – that she thought she could be a leader. Once Elizabeth jots down a few points, she’ll flesh them out. I loved the scene between Elizabeth and Will (Eric Stoltz). He has to remind her that she took over parenting him when their parents died – that’s pretty significant leadership! She’s thinking of a protest she staged with her lacrosse team – she tries to spin it as getting the girls’ bench closer to the water, but Will calls her on it – she really wanted to be closer to the boys’ bench! He’s thrilled that she’s running. On their second meeting, it becomes clear that Lorraine isn’t doing more than flattering her into writing. She calls Mike B and chews him out, telling him that there won’t be any book. Meanwhile, Matt (Geoffrey Arend) has seen Lorraine meeting with Elizabeth and knows who she is. He thinks he’s being fired. 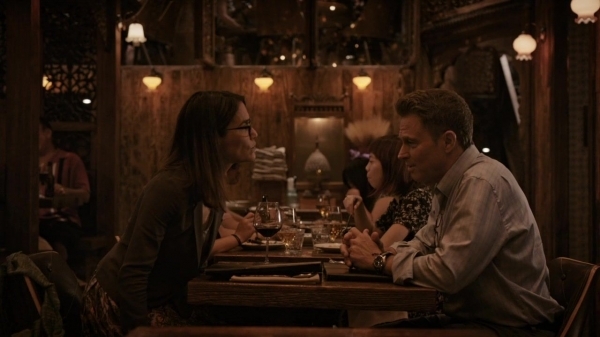 We get a really nice scene at the end of the episode in which Elizabeth tells Matt that she’s grateful every day for the soul and grace that he brings to his work. Matt offers to do the book – and I really thought that might be where they were going – but again, the show throws us a really smart curve ball. Elizabeth says maybe someday when she doesn’t need him in the trenches every day. And that’s another ghost dealt with. Finally, Jason ends up not submitting an acceptance for any of the scholarships. He initially tells everyone that he’s just decided that he doesn’t want to go to college yet. 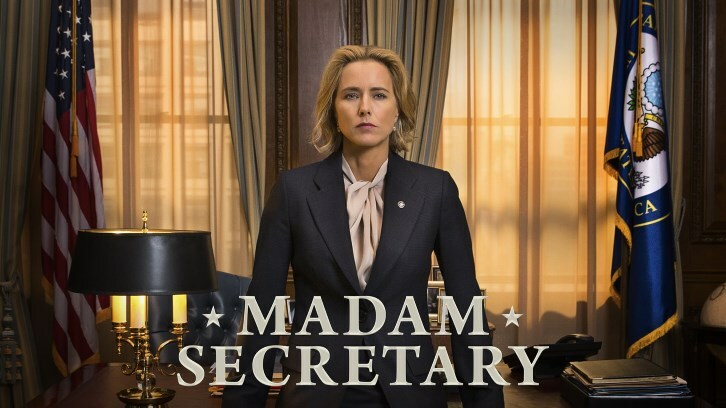 However, he – and Stevie (Wallis Currie-Wood) and Allie (Kathrine Herzer) have figured out that Elizabeth is running for President after Stevie sees the Superpac ad. Eventually, Jason admits that it’s his own ghosts of failure that made him not send in his acceptance. He feels like he fails at everything at first, and he doesn’t want to be an embarrassment to Elizabeth. I am enjoying seeing how Elizabeth’s decision really affects the entire family. 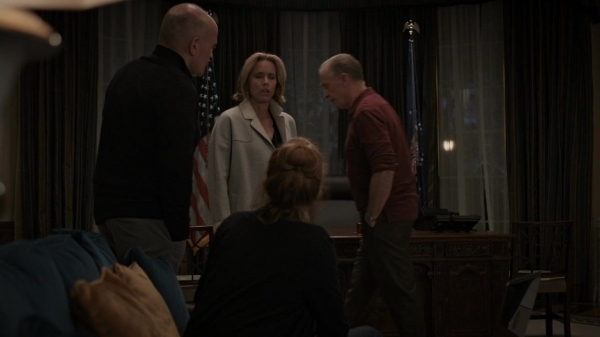 I liked the final family scenes quite a lot in this episode. 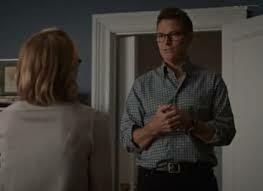 I liked that Henry admitted the Rochana had given him a glimpse of his own behavior and that he promises to offer guidance when Elizabeth needs it. I also really liked how excited everyone is that Elizabeth has decided to run. I do wonder if that enthusiasm will fade. What did you think of the episode? Are you hoping to see an in-depth look at the campaign trail or are you hoping to mostly jump ahead to Elizabeth being elected? Let me know your thoughts in the comments below!